UPDATE: After leaving Barrett's on Saturday, Mom and I both had ... how can I put this delicately ... "stomach issues". It was nothing major, but perhaps it was our own fault for ordering all that fried food. Because of this, we decided to give Barrett's another shot. We went in at around 1 p.m., sat at a table, and were served by Kelly. Mom ordered the smokehouse burger ($7.95) while I ordered a cup of French onion soup ($4.95) and an Oriental chicken salad ($8.95). Everything was delicious. The burger was cooked exactly to Mom's preference (medium well), and my greens were fresh and crisp. Mom's burger even came with a more appropriate serving of fries. Our bill came to $27+, and we left $33 on the table for Kelly. On this occasion we did use the restroom, and it was very clean and organized. Since everything went so well on this visit, I hesitate to mention that the "stomach issues" came back for a second time. 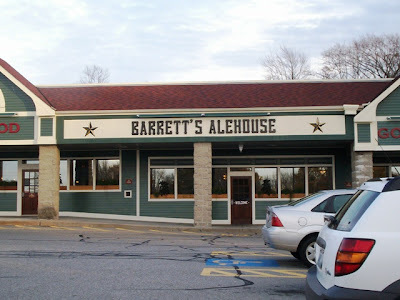 Taking another suggestion from our pile of reader requests, Mom and I decided to visit a new restaurant that my aunt Judy and cousin Judyanne both loved - Barrett's Alehouse. Located in Shaw's Plaza where T.K. O'Malley's used to be, we pulled into the busy parking lot at 3:30 p.m. When we stepped through the familiar doors, we were startled to see the changes that Barrett's had made to the building since its arrival. No longer was this a gloomy Irish pub with dark woods and low lights. It was now bright, cheerful, and family friendly. Mom and I waited by the door and were soon greeted by a friendly hostess. She asked us if we would like a table or a booth, and we chose a booth. She led us into the dining room and left us with two large, colorful menus and a list of the chef's specials to browse through. Although the booth seemed to be of average size, it was a bit on the tight side. Perhaps we're just getting *cough* curvier, but it seems as if they tried to cram a lot of seating against one particular wall. We didn't have to wait long before our waitress came over and introduced herself. Her name was Amanda and she quickly took our drink order - two Diet Pepsis. Since Mom and I had already browsed through the online menu, we kind of knew what we were going to get. When Amanda returned with our Pepsis (in plastic glasses with lemons attached), we placed our order. 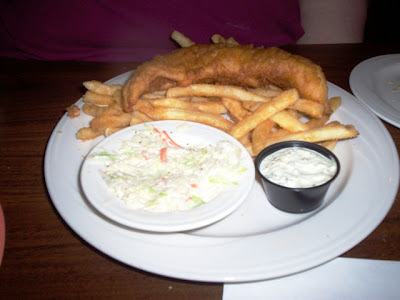 Mom ordered the English style beer battered fish n' chips ($9.95) served with fries, cole slaw, and tartar sauce, while I chose the Italian panini sandwich ($7.95), also served with fries and a pickle spear. Amanda asked what bread I would like my sandwich on. I had a choice between white, wheat, rye, or sour dough - I chose the latter. 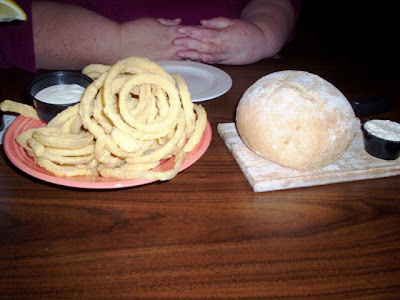 We also ordered an appetizer of the hand battered onion rings ($5.95) which were highly recommended by both my aunt and cousin, and a loaf of Barrett's freshly baked bread ($.95). Amanda said that the bread was worth getting because it was so good. After taking the orders, she went back to work while Mom and I checked the place out. 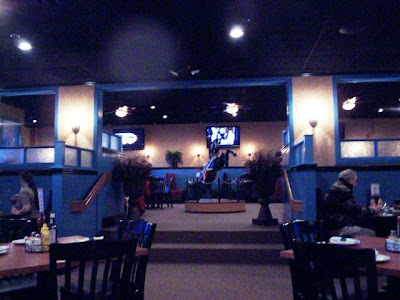 There are several different dining sections at Barrett's. There is a top level that you can access via a handicapped ramp at the front door or up the two steps inside of the restaurant. In the center of that dining area is a large statue of a carousel-style horse. The middle dining area consists of a row and a half of booths, and about four or five tables in between. Toward the end of the restaurant is the large bar area, and a smaller dining area for people who want to be close to the bar, but still have something to eat. 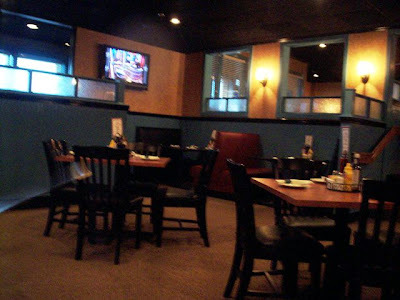 Flat screen TVs are seen throughout the restaurant, and the color scheme of wood, teal, beige, and red sat quite nicely against the black ceilings. The waitstaff are dressed in uniforms of black and beige, there is a condiment basket on every table, and Barrett's seemed very cool (ceiling fans), clean, and welcoming. The bread and the onion rings did not take long to arrive at all. The bread was round and served on a small carving board. Also on the board was a small container of what tasted like maple butter. The onion rings were plentiful and came with a side of zesty horseradish sauce. Mom, who has never had onion rings in her life, decided to throw caution to the wind and dig in. It was a pleasant surprise! Since she's not a big onion fan, she liked the fact that the rings were very thin and crispy - the batter being particularly good. She was very proud to have eaten onion rings. I thought they were also very good. They seemed to have a bit more batter than other onion rings I've had, but they were tasty. I enjoyed the horseradish sauce, which Mom didn't try. She could only handle trying one new thing at a time. We both enjoyed the tasty bread. It was soft on the inside, but perhaps a bit too crunchy on the outside, as Mom found out while trying to cut it. The maple butter was an added bonus, and went great with the hot bread. There is certainly a lot to choose from at Barrett's. Appetizers range from a plate of tri-colored tortilla chips and salsa for $4.95, to a plate of coconut shrimp or pan seared crab cakes for $9.95. Salads include the raspberry chicken ($8.95) which features grilled chicken, feta cheese, and craisins, and the Alehouse steak tip salad ($11.95) which includes grilled sirloin tips tossed with veggies and mozzarella cheese. Soups include French onion, New England clam chowder, and chili ($4.95), and the sandwich board features a lobster salad roll ($13.95), open faced prime rib sandwich ($9.95), the Smokehouse chicken sandwich ($7.95), and more. A tiny pint of beer is pictured next to items that are "Barrett's Best." 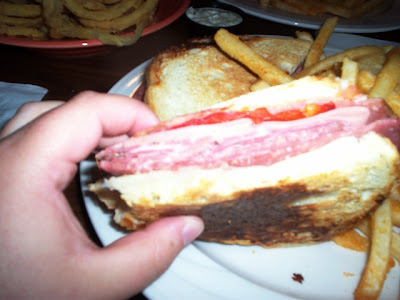 Barrett's also has panini sandwiches like the Reuben ($7.95) and the French dip ($7.95), and a pizza section where you can make your own from their large list of toppings (from $5.95-7.95). Specialty pizzas include BBQ chicken ($7.95), Greek ($7.95), and many others. Barrett's also serves Black Angus Alehouse burgers. All 8 oz. 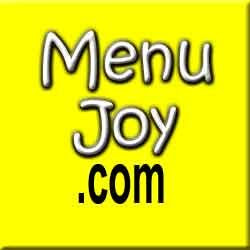 burgers are served on a grilled, buttered roll with fries, red onion, a vine ripe tomato, and a pickle spear. Entrees include dishes like the New York sirloin ($15.95) and the BBQ baby back ribs ($11.95 for 1/2 rack, $15.95 for full), seafood choices like baked scallops ($13.95) and seafood casserole ($13.95), and chicken and pasta dishes like the chicken Gorgonzola ($11.95), which features sauteed chicken tenders with roasted red peppers, artichoke hearts, mushrooms, and Marsala wine, finished with Gorgonzola cheese, and served over penne. You can add a salad to your entree (dinner or Caesar) for $1.95. Sides include baked beans, rice pilaf, baked potato (after 4 p.m.), broccoli, and much more for only $1.95. Customers must ask their server about the current dessert selections, but I do know that Barrett's can accommodate large parties for meetings, luncheons, and various events. They even have Wi-Fi for those people who just can't get off their laptops. Note: To-go orders will be subject to a three percent packaging charge. Before we knew it, Amanda was back with our entrees. I was surprised at how quickly the food came as there seemed to be a good sized crowd at this time. Both Mom and I pushed aside the onion rings and bread and started on our meals. Mom's fish and chips came with a generous portion of fries. Perhaps too generous, because she had to leave a lot behind. The fish was very well done. Mom said that you could really taste the beer in the batter, and the fish itself was very flaky, white, and tender. It was freshly cooked, nicely hot, and was a good sized portion. She really enjoyed it. The fries, although too plentiful, were also very good. The crust on the fries was very similar to the batter used on the onion rings. My Italian panini was jam packed with Italian cold cuts such as salami, cappicola, mortadella, prosciutto, and provolone cheese. Also in the sandwich were roasted red peppers (which I love), vine ripe tomato slices, olive oil, and garlic. 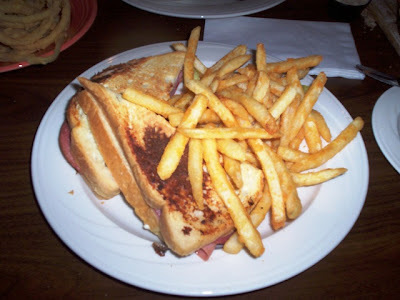 The taste was really delicious, and the sour dough bread was nicely buttered and grilled. My sandwich also came with an overzealous portion of fries, which I had to leave behind, and a pickle spear. Unfortunately, the fries wasn't the only thing I left behind. A fatty piece of one of the meats in my sandwich made me ill. There is nothing worse than having a very chewy piece of meat in your mouth. Because of this, I wasn't able to finish the rest of the last half of my sandwich. I blame the cold cuts entirely. It had nothing to do with the freshness of the meat, or the way the sandwich was made. I understand that some of those meats are usually a bit on the fatty side, and I should have been more prepared. I would still recommend this sandwich to anyone because the taste was really fantastic. I also ate Mom's cole slaw (she didn't want it), and that was very good. We left $36.75 on the table for Amanda (including 20% tip). She was a great waitress. During our meal, there were two women seated on the side of us at a table. They also ordered a bread, but unfortunately they had to send it back because it was frozen. I heard Amanda apologize and then quickly return with a new loaf. The women seemed to quiet down after that. Mom and I left at around 4:30 p.m. We did not use the restroom on this visit. I think it is fantastic that another bar/grill type restaurant has taken up residence in Fall River. With T.K. 's gone, the only other restaurant of this genre is Ninety Nine. Barrett's is the type of restaurant where you can bring your family, friends, or just stop by for a quick beer after work. Although the prices are a bit on the high side, and we've had better meals in other restaurants, we think that Barrett's Alehouse will do just fine in its new home on North Main Street.